The natural frequency of the purge chamber was measured and the vibration analysis performed showed an increase in stress values on the surface. The penetration of the stresses was nominal and hence the design was within the permissible limits. However, a design change was suggested near the attachment region, due to excessive stress concentration. Air drying unit in automobile applications assist in removal of moisture from the air that is used to operate the spring brake actuator. The purge chamber is where the dry air is stored and supplied to the actuator. The air is stored at high pressure inside the chamber, resulting in stress generation. Also, the effects of external excitation from the engine or the uneven road surface may add to the stress levels and cause the tank to deform considerably. 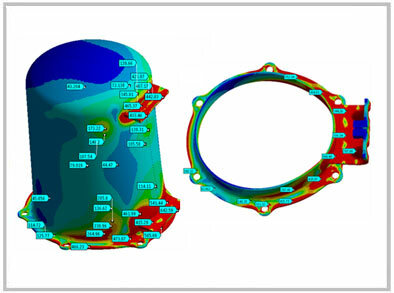 A leading automotive parts manufacturer from India approached Hi-Tech to evaluate the purge tank or chamber design for stress concentration and vibration analysis. Using structural analysis, the purge chamber was first analyzed considering the applicable boundary conditions and pressure loads. 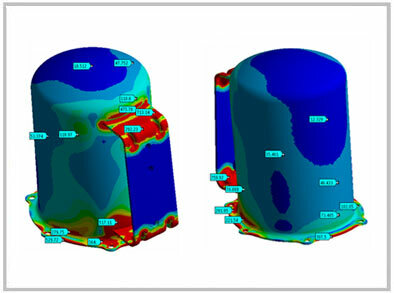 The natural frequency of the chamber was evaluated and the vibration analysis was performed for different operating pressures and vibration modes. The results showed that there was an increase in stress values on the chamber surface. However, the penetration of the stresses was limited, ensuring the design safety. Also, it was suggested to increase the thickness of the chamber near the attachment to compensate high stress concentration.